Although the term "blouse" now refers to a woman's separate bodice of a different material than the skirt, the word derives from the French name for a workman's loose smock and was first used in English for men's and boy's shirts. The feminine blouse has its antecedents in the undergarment known as a smock, shift, or chemise, which served the same purposes as the male shirt: worn next to the skin, it absorbed bodily soil and protected outer garments. In the early 1860s full-sleeved loose bodices came into vogue, called Garibaldi shirts since they were modeled on the famous red shirt of the Italian nationalist and freedom fighter. Peterson's Magazine in May 1862 (p. 421) thought these blouses, often made in red or black wool or white or striped cotton, were warm, comfortable, inexpensive, and practical, extending the life of a silk skirt which outlived its matching bodice. Puffed "in bag fashion" at the waist, Garibaldi shirts sometimes created an ungainly silhouette with a hooped skirt, but a boned waistband called a Swiss belt could be worn to gracefully ease the transition between top and bottom. The idea of fashionable separates for women had emerged. In January 1862 Godey's Lady's Magazine (p. 21) predicted that the advent of the feminine shirt was "destined to produce a change amounting to a revolution in ladies' costume." By the 1890s, these bodices, now called shirtwaists or waists, had indeed dramatically increased the average woman's clothing options. Shirtwaists could be severely tailored with masculine-style detachable starched collars and cuffs, or very feminine in lightweight fabrics trimmed with lace, insertion, and other lavish decoration. Shirt-waists were suitable with tailored suits, with a skirt for housework and sportswear, and with bloomers for cycling or as gym costumes, while dressier versions were worn for afternoon receptions, the theater, and evening wear. In 1895, Montgomery Ward's spring and summer catalog (p. 37) told customers, "Your old dress skirt worn with a neat laundered waist provides you with a cool, comfortable and up-to-date costume that will quite astonish you." They commended the shirtwaist as "by far the most becoming and sensible article of woman's attire to receive fashion's universal approval." Although they could be made at home and commercial patterns were widely available, shirtwaists, with their loose fit, were the first women's garment to be successfully mass-produced. Ready-made waists could be purchased at incredibly low prices-as little as twenty-five cents from Sears, Roebuck and Company in 1897. The burgeoning apparel industry utilized economies of scale and power machinery, but cheap garments were also the result of sweatshop production by unskilled and often exploited labor. Workers could toil seventy hours a week for as little as thirty cents a day, frequently in egregious conditions. One of the many sweatshops in Manhattan churning out these popular garments was the Triangle Shirtwaist Company, which occupied the top three floors of a ten-story building and ensured maximum production by locking the exit doors. When fire broke out on 25 March 1911, many of the 500 workers, mainly Jewish immigrants aged thirteen to twenty-three, were trapped; 146 women died in less than fifteen minutes. While this tragedy helped crystallize calls for reform, led by organizations such as the International Ladies Garment Workers Union founded in 1900, mass production continued to create victims as well as affordable clothing. Many sweatshop workers no doubt wore shirtwaists, for these practical, inexpensive, and unobtrusive garments were a boon to women in factories, offices, and those who would later be dubbed "pink collar" workers. Yet at the turn of the century, the well-to-do, imperiously handsome women immortalized by illustrator Charles Dana Gibson were often depicted wearing immaculate starched shirtwaists during vigorous walks or rounds of golf. The "Gibson girl" soon became such an American icon that she gave her name to styles of waists and the preferred high stand collars. As fashion evolved, shirtwaists gradually became more relaxed; by the 1910s the "middy blouse," modeled on the loose sailor-collared shirts of seamen, was especially popular with girls and for general sport and utility wear. The shirtwaist, now also called a blouse, proved remarkably accommodating in style and price. By 1915 Gimbel's catalog (p. 44) could state, "The shirtwaist has become an American institution. The women of other lands occasionally wear a shirtwaist-the American woman occasionally wears something else." Mass-produced or custom-made, serviceable or dainty, the versatile blouse played an essential role in the democratization of fashion. Suiting Everyone (Kidwell and Christman, p. 145) states, "For the first time in America, women dressed with a uniformity of look which blurred economic and social distinctions." While not as universally worn, the feminine blouse adapted itself to almost every occasion through the mid-twentieth century. The haute couture ensembles of elegant matrons often featured blouses to match suit jacket linings, while college girls coordinated Peter-Pan collared permanent-press blouses with casual skirts or slacks. As more women joined the labor force-nearly a third of the American labor force was female by 1960-the blouse continued to be the workhorse of clerical workers, teachers, and those in service industries. In 1977 John T. Molloy in The Woman's Dress for Success Book (pp. 54, 55) famously advocated a "uniform" for the executive woman consisting of a skirted suit and blouse-but warned that removing the jacket would make her look like a secretary. He argued that since the blouse made a measurable difference in the psychological impact of the suit, it should not be selected for emotional or aesthetic reasons, but for its message. Molloy claimed his research showed a white blouse gave high authority and status, and his recommended styles included man-tailored shirts with one button open and the "acceptable nonfrilly style" with a built-in bow tie at the neck-the so-called floppy bow that soon became a "dress for success" cliché. While blouses were important in reflecting the wearer's personal style, this message was sometimes over-simplified. Toby Fischer-Mirkin's 1995 book Dress Code (p. 94), for example, definitively states that an unbuttoned shirt collar indicates an open-minded, flexible woman, a loose collar reflects a casual woman who may be slack in her work, while an angular or oddly shaped collar proclaims a highly creative and unconventional individual. In the late twentieth and early twenty-first century, the blouse-like the earlier Garibaldi shirt and shirt-waist-has been overshadowed by trendier permutations of feminine tops, from T-shirts and turtlenecks to sweaters and man-tailored shirts. Introduced less than one hundred and fifty years ago, the concept of women's separates has become a democratic sartorial style. 1897 Sears Roebuck Catalogue. Reprint edited by Fred L. Israel. New York: Chelsea House Publisher, 1968. Fischer-Mirkin, Toby. Dress Code. New York: Clarkson Potter, 1995. Gimbel's Illustrated 1915 Fashion Catalog. Reprint, New York: Dover Publications, Inc., 1994. Kidwell, Claudia B., and Margaret C. Christman. Suiting Everyone: The Democratization of Clothing in America. Washington, D.C.: Smithsonian Institution Press, 1974. 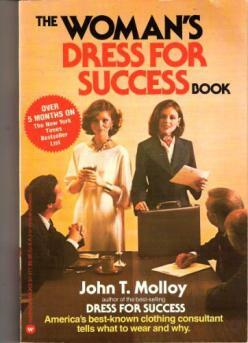 Molloy, John T. The Woman's Dress for Success Book. New York: Warner Books, 1977. Montgometry Ward & Company's Spring and Summer 1895 Catalogue. Reprint, New York: Dover Publications, Inc., 1969. Schreier, Barbara A. Becoming American Women: Clothing and the Jewish Immigrant Experience, 1880-1920. Chicago: Chicago Historical Society, 1994.